I must acknowledge that not all of our party was as enthusiastic about seeing bats as I was; some of us were worried about close encounters with bats or guano. 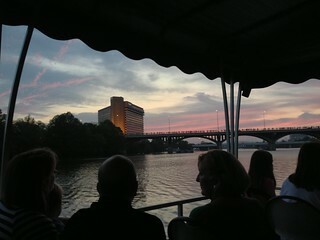 As a compromise, we arranged a ride on a riverboat cruise in a covered boat. If Lady Bird Lake were set down near Pittsburgh, it would be regarded as a narrow, shallow spot in the river - all things are relative. But it's a pretty lake, with lots of people using it, running alongside, riding bicycles, and so forth. 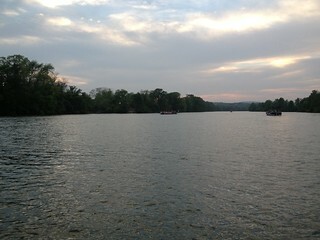 Around sunset, we parked upstream from the bridge and waited for the bats to get active. The sunset was nicer than my iPhone could capture. 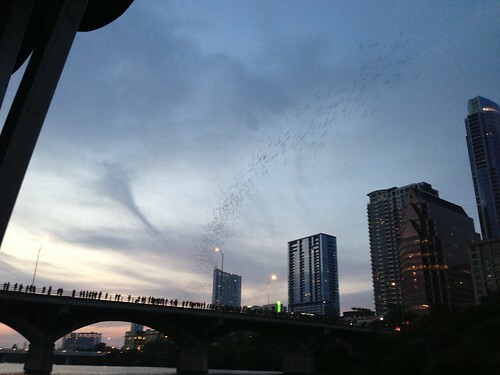 The bats emerged in a long thin stream heading east, like a trail of smoke with larger particles. 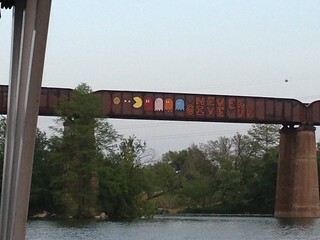 The bats did not come anywhere close to us; our closest view was to see them wheeling out as we passed under the bridge to return to the dock. I found the effect oddly serene, because there were so many bats that they lost their individuality and were only comprehensible as a continuous flow. It seems that bat should be a mass noun, like sheep or deer or fish. 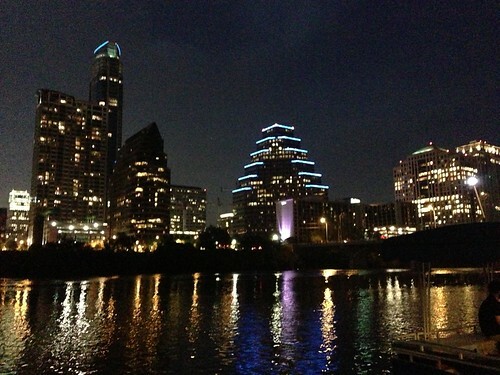 Once it became fully dark, it was impossible to see the bats, but there were some lovely views of downtown Austin.